The structure of a modern skinny Moth has quite a lot to do. The rig is trying to twist the hull one way, and the rear wingbars are loaded with the hull weight trying to take it the other way. Stiff hulls and wings feel nice to sail with, but can we measure it in any way? I'd seen lots of photos recently of various boats with what looked like big deflections, and was interested to try and put some numbers to it to allow for some comparisons. 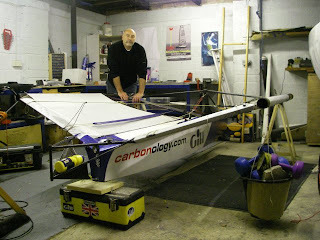 So during another week of gales in Weymouth I put the boat in the workshop. 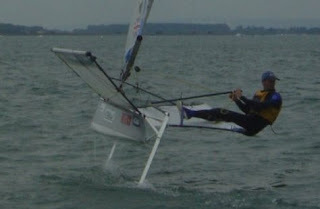 The boat was supported on two supports under the shroud attachment points on the front wingbars, and under the transom. Then a 30kg weight (calibrated bucket with bricks and weights!) was hung from the rear wingbar corner, with the diagonally opposite corner being supported to prevent the boat tipping over. It would be interesting to see how other boats compare? At least with a vague method (and a few ideas on how to get hull vs bar bend next time) it starts up a basic library of data. Certainly my Mistress 1 was probably one of the worst I'd seem for rear bar bend! Don't worry Toby - new bars went on before I sold it on!